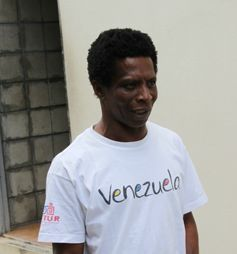 The Kingstown resident, who was freed from the Serious Offences Court on April 15, reappeared in court Tuesday, April 30. The 32-year-old man was charged with, on April 28, being armed with a cutlass and a knife, robbing Carlos Bibby, 37, security guard of Redemption Sharpes of a black and white cellular phone valued $400 and allegedly assaulting Bibby by scraping him on the left side of his face with a knife. He was not allowed to answer to the charges and was remanded in custody. Chief Magistrate Sonya Young set a Preliminary Inquiry date for September 26. It is alleged that at the time of the incident, Bibby was walking in the Wilson Hill area, in the company of a woman. SEARCHLIGHT spoke to a man who was present in the area, around the time of the incident. The man said he had just come from the Gospel Fest activities at Victoria Park, shortly before midnight. The man, who preferred anonymity, said he was walking down to the Roman Catholic Church area to get his vehicle. He said while in his vehicle, a friend called him. The man said when he came up to where his friend was, he heard the voice of a female crying for help. He said when they saw the woman, she was visibly âtraumatizedâ and âshaking uncontrollablyâ. He said he questioned her and she said that her boyfriend engaged in an altercation with a man. The man said he then took the woman and her boyfriend to the police station. The man said he left the scene shaken, because of a similar experience that a friend of his had had. The good Samaritan is of the view that perpetrators of these crimes should be made to feel the full weight of the law. âThe most I could have done was to offer them a ride. I just hate to see people take advantage of other people. The guys from the community were really searching for [the attacker] and I donât know what they might have done if they had caught him. Hamilton was released on April 15 after successfully defending himself of charges of threatening to kill Prime Minister, Dr Ralph Gonsalves and Superintendent of Prisons Linus Goodluck.